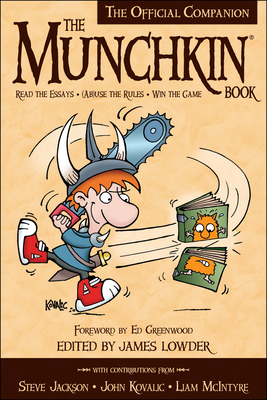 By gently - and sometimes not so gently - mocking the fantasy dungeon crawl and the sacred cows of pop culture, the Munchkin card game has stabbed and sneaked and snickered a path to the pinnacle of success. Along the way, it has sold millions of copies, been translated around the world, and spawned more than two dozen sequels and supplements. James Lowder has worked extensively on both sides of the editorial blotter. His bestselling, widely translated dark fantasy novels include Knight of the Black Rose and Prince of Lies, and his short fiction has appeared in such anthologies as Shadows Over Baker Street and The Repentant. As an editor he's helmed over a dozen anthologies, including Curse of the Full Moon and the recent Smart Pop collection Triumph of the Walking Dead, and has directed book lines or series with subjects ranging from Arthurian Britain to zombies. His nonfiction writing on film and comics has seen print in Amazing Stories, Sci-Fi Universe, and the Smart Pop collections King Kong Is Back! and The Unauthorized X-Men.